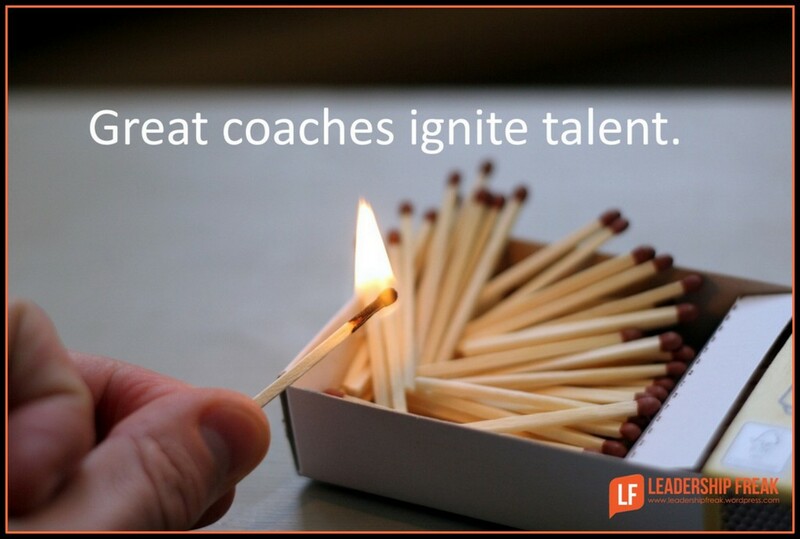 Coaching is an act of engagement that ignites, engages, and maximizes talent. Reflect on performance without feeling defensive. Feel hopeful about their future. Trust their managers, leaders, and themselves. Commit to coaching as a strategy for developing talent and getting things done. One of the leaders I coach has a goal to dedicate over 50% of his time to coaching. Train management teams in coaching skills. Spend time assessing and understand your players. Great coaches know what makes people tick. Stop putting square pegs in round holes. They don’t like it. Expect people to own their own development. Engagement is both a top-down and bottom-up activity. The first quality of coachable employees is aspiration to be better. Create a systematic approach to coaching conversations. Try an acronym like PIT SIT’N. PROBLEM or POSSIBILITY. What are you trying to achieve or solve? IMAGINE things going perfectly. What does it look like? Draw a picture of success. What are you currently TRYING? What do you need to STOP? Motivated people often falsely believe that trying harder will magically make ineffective behaviors effective. Give it up. What IMPERFECT behaviors will move the ball down the field? Go for a first down, not a touchdown. Perfect as you go, not before you go. What specific behavior will you TRY this week? When? How? What will you do next week to continue moving forward? Coaching-managers engage, develop, and maximize talent. What does coaching-management look like to you? What are the positives and negatives of moving toward coaching-management? spend less time assessing and more time understanding is a big point here. it becomes the difference between telling people what they need to do and gaining perspective on the roadblocks seen by those you coach. there is a lot of upside once people new to coaching get past not having the time, the skill or wanting to in the first place because its different. We need to remember – people first! Great topic Dan! You will find the biggest barrier to the coaching style is the fear of one losing their power. Individuals that feel the need to reaffirm their position by using perceived actions of power will fight tooth and nail to keep coaching out of the organization. Unfortunately, these types of individuals make-up the majority of management positions hence the lions share of people being disengaged. Therefore, it is the responsibility of the leader of an organization to establish the climate for success before things will ever change. Coaching and mentoring can actually work better in the long run than sporadic training sessions. Coaching requires commitment, and if done well, can help build bonds and motivation. There are risks that the mentor may try to create a clone, however. Great procedure acronym, PIT SIT’N. Clearly it would be great for coaching. But, I can also see it as a great problem solving acronym! I’m comfortable with my OSCAR problem solving but it’s one to suggest to others. One thought: Somewhere between STOP and IMPERFECT, maybe elsewhere, I think there should be some consideration of need to learn. Thanks John… “What do I need to learn.” Bingo! Great framework for coaching and problem-solving! I love the fact that your posts are short and straight to the point.